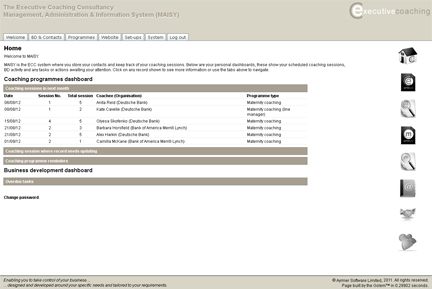 Having successfully developed a content management system for The Executive Coaching Consultancy Ltd., last year, we were delighted when they asked us to extend the system. Historically the business collected information using spreadsheets and they asked us about creating an on-line system that would simply replace them. They soon realised the benefits of a more sophisticated system that would reduce duplication and errors as well as improve the quality of the data collected. 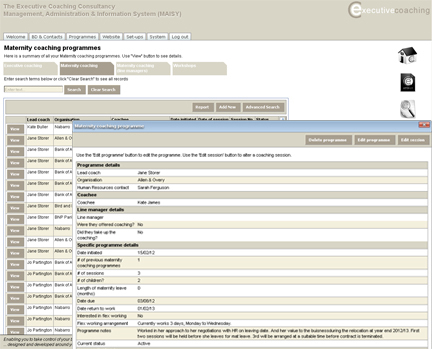 The system encapsulates the business development, client relationship management and delivery of coaching programmes provided by The Executive Coaching Consultancy Ltd., and allows the collection critical data that will help capture their business intelligence in the future. The system will also send out emails when coaches need to take action, ensuring tasks don't get missed. Having successfully developed the system we launched a beta version and helped the team with the collection of their data, ensuring there was no duplicating and cleaning it before completing the data migration from the legacy sources to the on-line database. As a result the business has improved the underlying intelligence ensuring information is collected, stored and retrieved in a far more efficient way. Ayrmer Software bent over backwards to help us develop our online database application. They made every effort to try and understand our business and the processes we use, translating this into a straightforward system. We are probably the most untechnical, IT illiterate, people that they have ever had to deal with. They were endlessly patient and generous with their time in order to deliver what we wanted. We now have an easy to use way of recording and managing our business activity, which we're delighted with.